I worked in digital marketing for 15 years: heading up data processing for both DoubleClick and Yahoo’s advertising division, and then founding one the first and largest search retargeting companies, Magnetic. I have made a lot of friends in the industry and for this reason I feel bad about what I am going to say. The entire digital marketing industry has forgotten the definition of marketing. Marketing is not about being the last ad seen or the last ad clicked. Marketing is about influencing a customer to do something they weren’t going to do. Now perhaps it’s because digital marketing has failed to deliver on the promise of true measurement that marketers have turned to this other metric, but this is not a measure of the power of marketing. To digital marketers’ defense, it is effectively impossible to deliver enough ads and test ads to get a statistically significant sample, and thus measure lift. However, tricking everyone into thinking that measuring clicks and cost per acquisition is meaningful isn’t right. 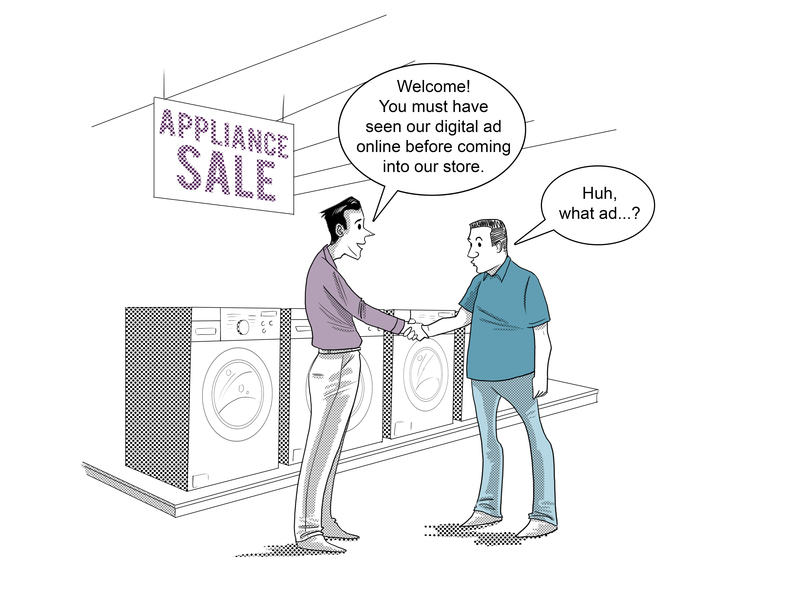 In digital marketing, everyone wants to target ads based on intent. So you are basically showing ads to people who were likely to buy your products anyway. This is great if those people were on the fence, but this is a waste of money if they truly were going to buy anyway. How can you tell? Who are the right people to target with ads? These questions are the questions that drove me to start Purple Cloud. I don’t know the answer to those questions, but what I do know is that no one knows the answers to those questions. The aforementioned study proves it. The answer is to ask a different question: how do you influence a customer to do something they weren’t going to do? That answer is far simpler. If you want to influence a person to purchase a product, you need to focus on the customer journey and worry about measurement second. 93.6% of retail spend is made in brick-and-mortar stores. Customers spend 5 hours and 46 minutes online each day. The average purchase over $1000 is researched online for at least 45 days. Are you beginning to see the customer journey? So the customer does their research on your site, possibly visits a store, or talks to friends or loved ones about the product. Now you can bombard that person with site retargeting ads to make sure they don’t forget about your company or product, but that has only a small influence on them. However, current digital marketing measurement techniques will tell you that ad is the most effective ad unit regardless of its quality or influence, but rather because it was the last ad seen before purchased. In fact, the site retargeting ad could be run on inexpensive “below the fold” digital media at the bottom of a website, where the customer doesn’t see it, but the false measurement thinks the customer saw it and would still show a strong result. Let’s get back to the customer journey. They visit the store and speak with a sales associate. The customer-sales associate relationship has been shown repeatedly to be one of the greatest influencing factors, not only on the purchase, but on customer loyalty. The customer asks their questions, looks at the product, and purchases it. So what do you do with the $137.53 Billion spent annually on digital advertising? Just give it to Purple Cloud? Well, of course. No, but you should begin to think about how you influence that customer across that journey. How you should provide better service, stronger relationships with sales associates, build better customer loyalty, and get an improved understanding of what your customers do and do not like about your products. In short, you should communicate with your customer throughout their journey, regardless of where it takes them (print, digital, TV, radio). Not to repeat a line from my last blog post, but this is what we do at Purple Cloud.